Amanda was first rescued on Christmas Day 1973 after being badly injured by a boat hit. She lived many years at the Ellie Schiller Homosassa Springs Wildlife State Park until her recent death on August 16, 2011. 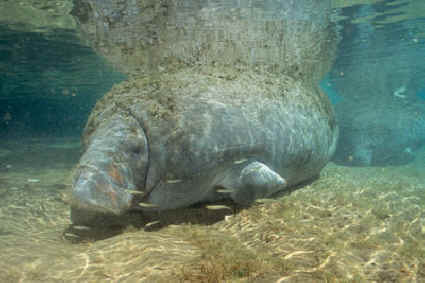 Amanda, a longtime adoptee in Save the Manatee Club's Adopt-A-Manatee program died August 16, 2011. Club staff were notified the following day by Art Yerian, park manager at Ellie Schiller Homosassa Springs Wildlife State Park, that Amanda died during a medical procedure. Amanda was loved by many adoptive parents, manatee researchers, and Save the Manatee Club staff. She was first identified by manatee researchers in 1973 when she received a motorboat injury, which resulted in a rescue along Florida’s southeastern coast. Amanda and her uninjured calf, Ariel, were taken to Miami Seaquarium where they stayed for several years. Amanda was easily identified by the long, parallel propeller scars on her right side. In 1986, both Amanda and Ariel were taken to their new home at Homosassa Springs Wildlife State Park. While at the park, Amanda gave birth to three other calves: Savannah, Star, and Betsy. 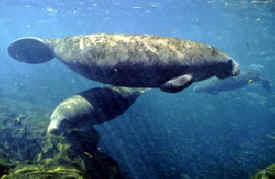 Both Ariel and Betsy are also adoptees in Save the Manatee Club’s adoption program. Amanda was lucky to have survived the watercraft collision in 1973, and rangers at the park often pointed out her scars as an example of why it is important for boaters to slow down in manatee habitat and obey posted speed zone signs. Known for being sweet and affectionate, Amanda was frequently spotted resting with Rosie, another SMC adoptee, or daughters Ariel and Betsy. She liked to hang out with the other manatees at the park and was curious about park visitors as well. When not resting, she was often spotted swimming near the park’s underwater observatory. We were saddened to hear of Amanda's passing. My daughter chose to adopt Amanda for her 6th or 7th birthday, and we visited her at Homosassa in 2004 and spent the whole day at the park. At the end of the day, Carly wanted to find Amanda and say goodbye before we left. We found her eating lettuce at the observation deck. Carly leaned over and said "Goodbye Amanda -- nice meeting you!" I couldn't believe it. Amanda knew her name and responded by doing some rolls. Carly encouraged her with several "good girl, Amanda, good girl!" exclamations and Amanda continued rolling. Carly asked to go downstairs and watch her underwater. We watched from there for a few minutes. Amanda knew we were there and swam up to the glass. Carly put her little hand up and touched the glass, and Amanda swam up slowly and pressed her face to the glass, as if she were kissing Carly's hand! It was one of the most magical moments I have ever witnessed. 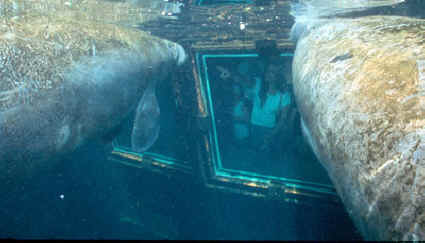 Rosie and Amanda check out visitors at the park's underwater observatory.